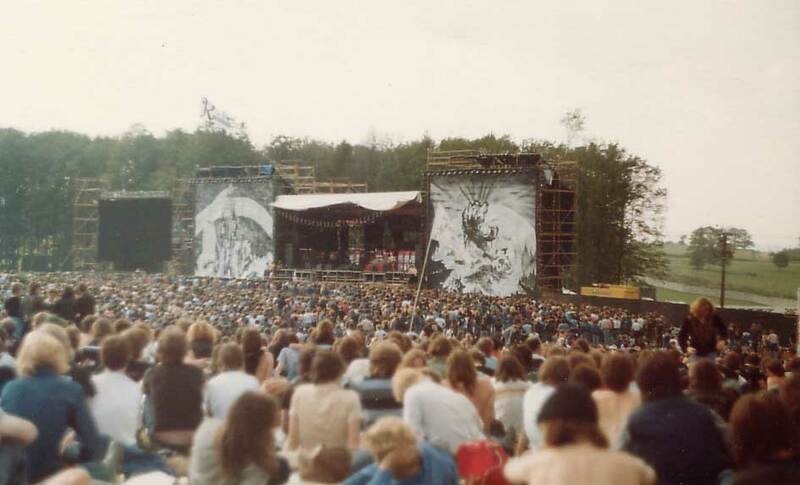 In mid-1980, Paul Loasby decided to leave the Harvey Goldsmith promotions company to set up his own business, with the first project planned to be a one day heavy metal/rock festival, to compete with the well-established 3 day Reading Festival. 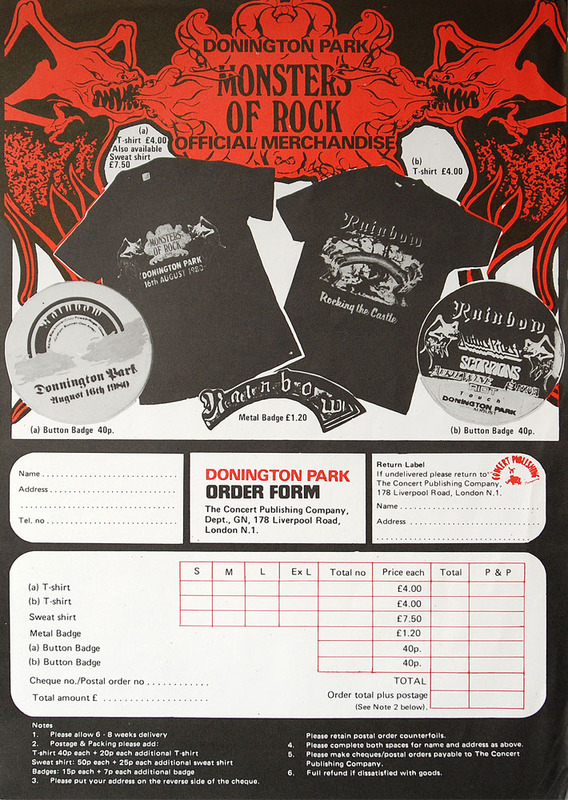 Loasby (who’d successfully handled the recent UK Rainbow tour logistics) approached Rainbow’s manager, Bruce Payne to suggest Rainbow should headline the event. The deal was struck and the venue booked at Castle Donington. 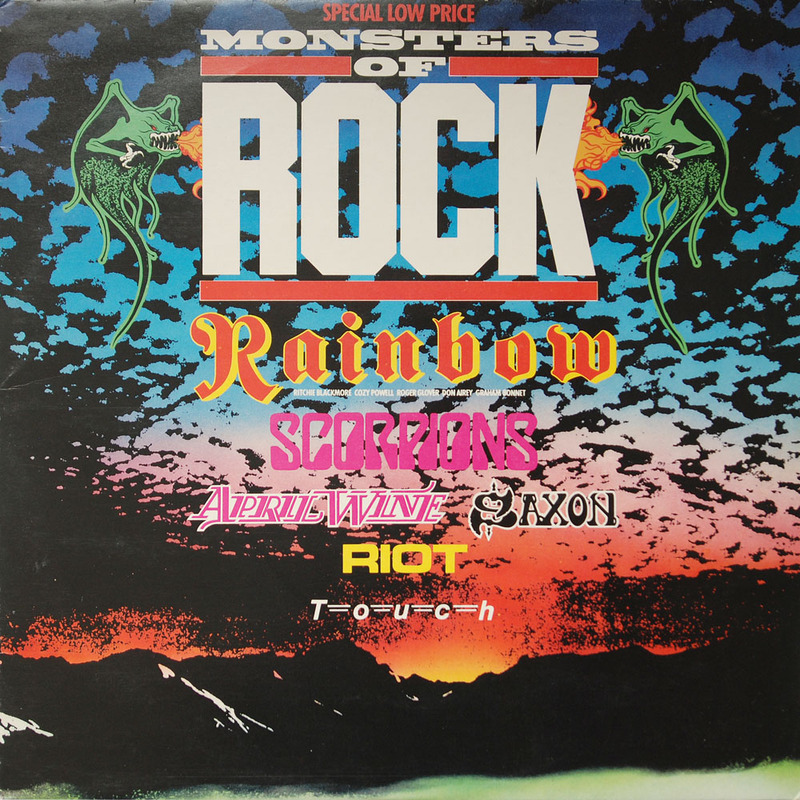 The remaining line up was confirmed with Judas Priest, Scorpions, Saxon, April Wine, Riot and Touch. The event took place on 16th August, and despite heavy rain in the preceding days, the day went according to plan. Although, Cozy Powell’s pyrotechnics test the day prior to the gig caused around £18,000 worth of damage to the PA, which possibly ensured the sound on the day was a little quieter than originally intended. 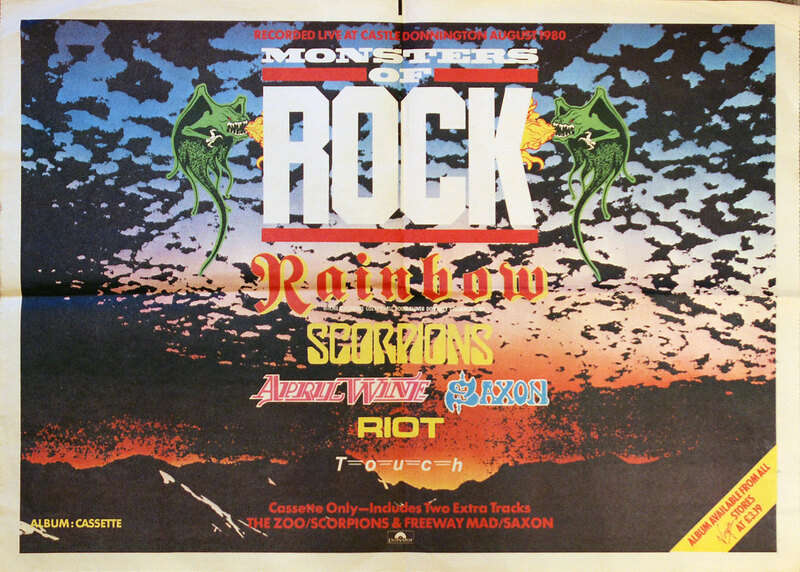 This gig was Cozy Powell’s final show with Rainbow. He’d already announced his intention to eave but had promised to fulfil all obligations on the UK shows. 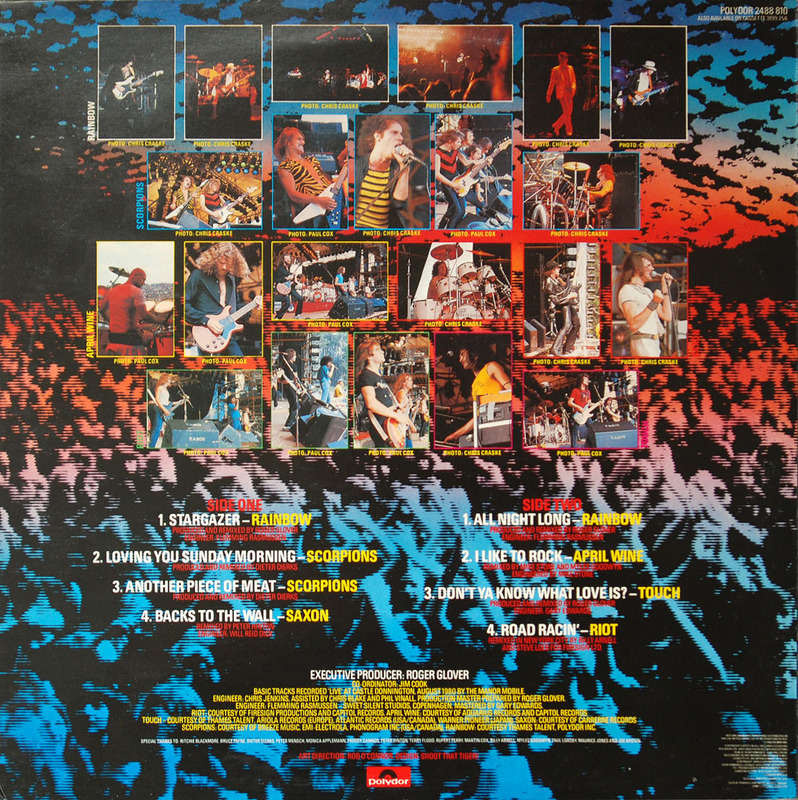 Of the bands on the bill, only Judas Priest declined to submit tracks for the LP – their current live album ‘Unleashed In The East’ was still on general release and charting. ‘Stargazer’ opens the album and is obviously a track from midway through the set so it seems a strange choice to open the album. Bonnet makes a worthy attempt at Dio’s vocal. The heavy presence of keyboards helps to fill out the sound (given the lack of philharmonic orchestra!). Lengthy guitar solo from Blackmore and overall a more than passable attempt at a Rainbow classic. Side 2 begins with ‘All Night Long’ and again it’s a credible live version with Bonnet hitting all the right notes, but backing off slightly on the sustained notes. The mid-section is a crowd-sing-along type, but this is where Bonnet seems to have lost the plot slightly. His audience interaction leaves a lot to be desired, claiming to actually work for the BBC and offering to do interviews. He then starts doing bird whistle impressions…bizarrely the crowd actually start reciprocating at one point! He finally claims to have had enough and states ‘bring on the mushy peas…’. God knows what Blackmore thought of the proceedings. As the song ends, Blackmore starts up the familiar ‘Blues’ instrumental he started with Deep Purple and carried through early Rainbow. My fave on this album has always been the Riot track.